I’ve always wanted to go on a picnic but there are very few nice places here in Manila to do it – Luneta is too crowded, too hot and while the long stretch of beaches in our country can be very tempting, I can’t very well just hop on a plane every time I wanted to go on a picnic. Lo and behold, the perfect opportunity presented itself while we are out and about in Paris. I mean, what with all the really good cheese and the even better and cheaper wine, how could we not give in? We even had a nice wicker basket all ready at the apartment and a couple of plastic, stackable wine glasses so really, there was no other choice. 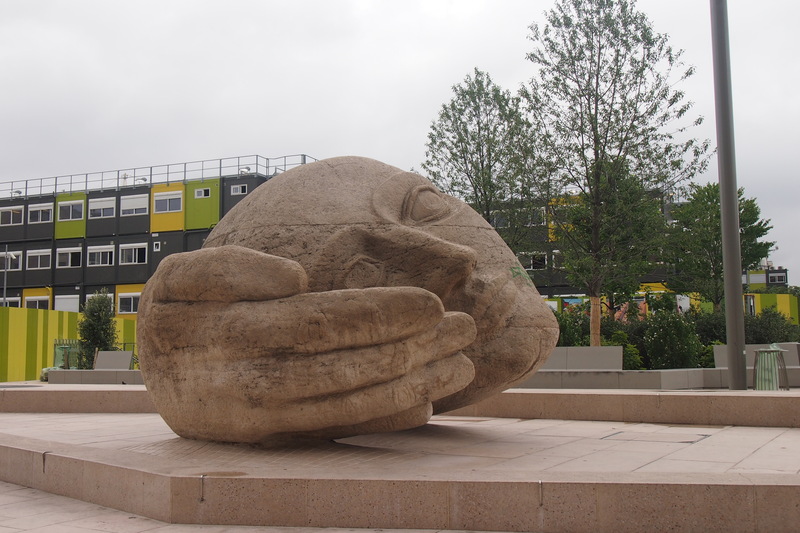 Thankfully, our apartment was situated just ten minutes from one of the modern parks in Paris: the Jardin Nelson Mandela. Previously named Jardin des Halles after it location (and indeed, you can’t miss it as the metro/RER stations for Chatelet and Les Halles is right underneath, perhaps the busiest metro station in all of Paris), it was renamed a few days after Mandela died. The small bit of green serves as a sort of oasis amidst bustling construction in the area and the looming church of Saint Eustace a few steps away from it is the perfect backdrop. The weather seemed to cooperate with us too as it was neither hot nor cold – it was downcast enough for us not to sweat buckets yet sunny enough that we didn’t feel threatened by rain. We took some time figuring out how to set our stuff on the comforter we’d brought (we didn’t have any of those red gingham patterned cloths, but you have to admit, our comforter looked perfect! ), and going about cutting the cheese and ham, and taking photos (of course!) that by the time we’ve settled, a policeman had come to order us politely out of the park. 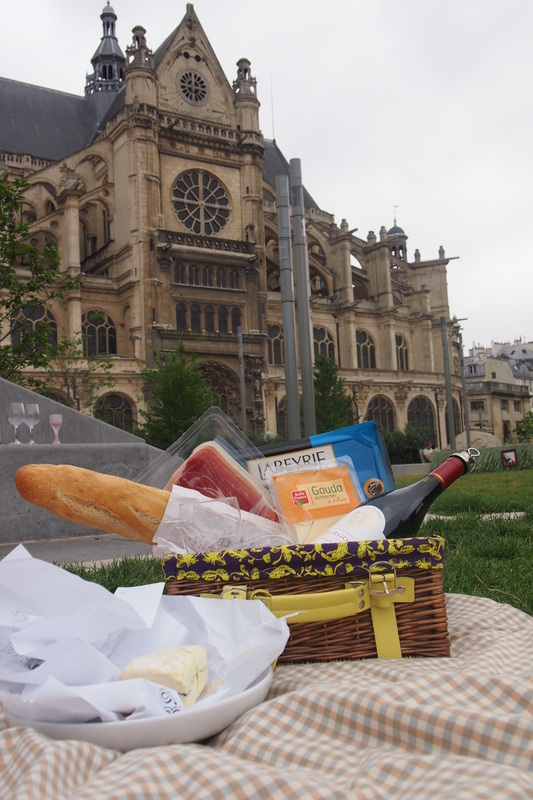 Baguettes, cheese, ham, and a bottle or two of red wine. That’s the Saint Eustache in the background. The church, built sometime in the late 16th century, is considered a masterpiece of Gothic architecture and it’s easy to see why. Whenever I think of Gothic architecture, I always end up thinking of halls of Moria (Lord of the Rings). This is a perfect example. I’m such a nerd, I know. 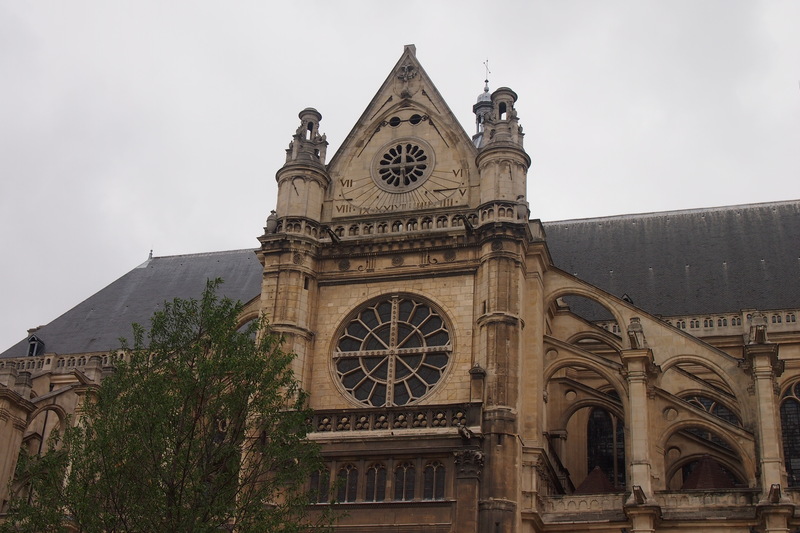 The church is pretty accessible too, and is located near Les Halles, once Paris’ fresh produce market. This perhaps explains a cute little display at the back of the church that shows how its market must have looked like hundreds of years ago. 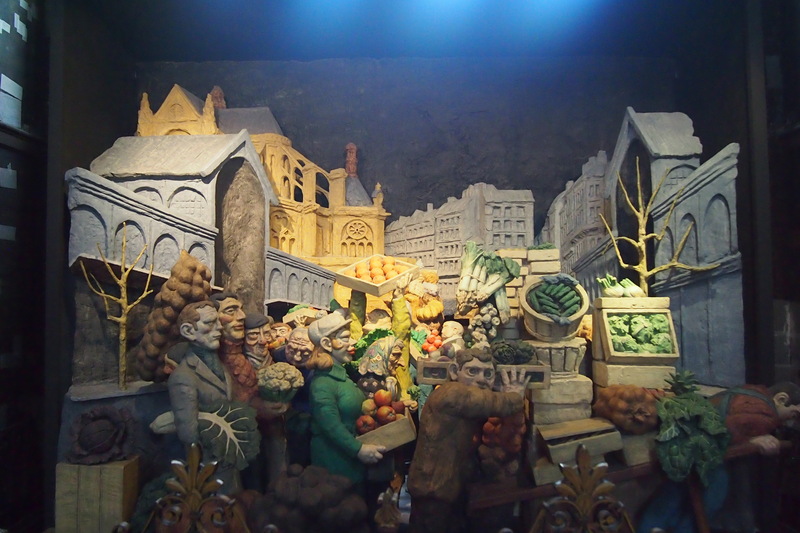 A diorama of farmers peddling their goods in the market. The stained glass windows are also a sight to behold. They’re so vivid, almost like paintings. You know how it feels like a miracle is about to happen when you sit in one of the pews, and the sun’s rays slowly penetrate through the stained glass windows and you see dust particles floating around? I had many of those moments while touring the church that my skin was crawling with goosebumps. 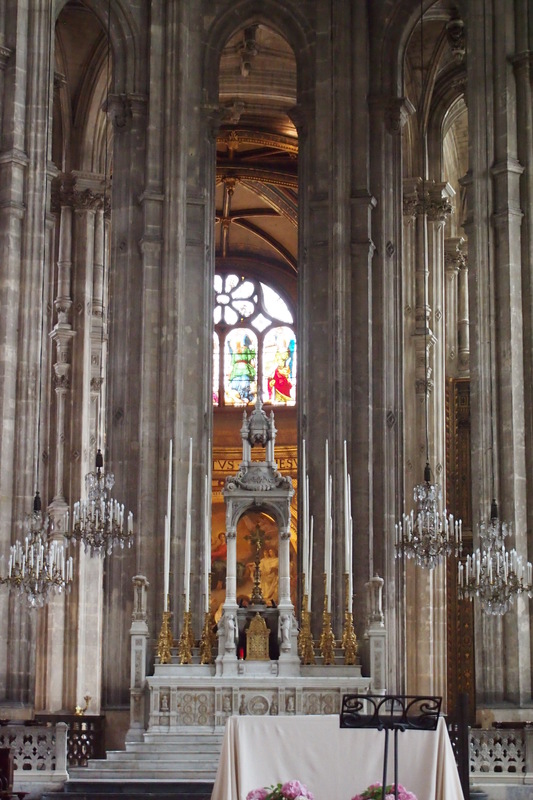 Europe is full of beautiful churches and since my first visit, I promised myself I would lit candles in all the churches I can visit and pray for my loved ones. And of course, world peace. 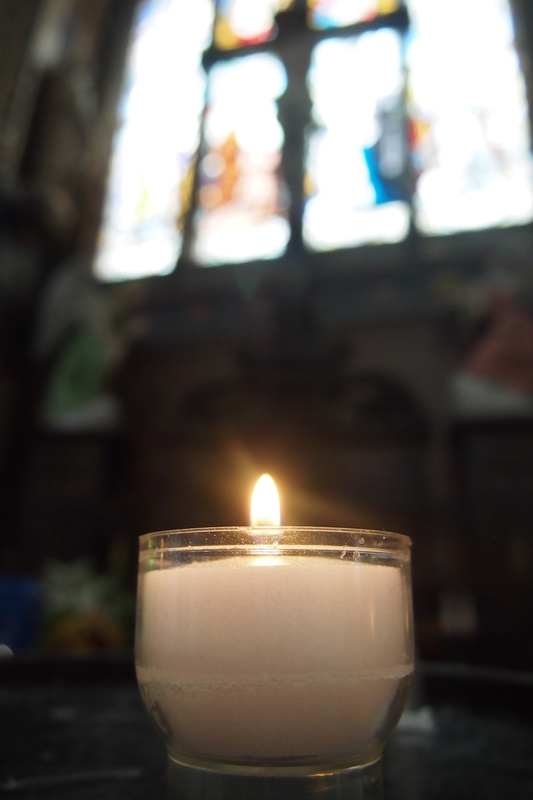 I always light a candle when I visit a church, especially when it’s new. And I always wish for the same thing: happiness and health not just for me, but for all my loved ones, especially my two little boys. I used to think we have the most beautiful churches in the Philippines; while I still think they’re beautiful, nothing prepared me for the grandeur of Europe’s churches. I can’t get enough of them!